Mark the date: these are the first photos taken after 5:30 p.m. with enough light - again, January you never fail to make me love you so. Onto my knitting this week. First up is my fair isle sweater - isn't it beautiful? I cannot wait to wear it. That's assuming it'll fit (which it should). Luckily it's 100% wool so I do have some blocking wiggle room if I need an inch width-wise. I love sitting and knitting on this sweater and sometimes I knit slowly to make the happiness last. These socks are for my husband who loves green. I finished the first sock over the weekend and promptly started the second sock. I'm trying to not knit on them on home so they can be taken to babysitting in case I have free time (nap!) to catch a few rows. Now we get to the BLACK blanket that is impossible to photo to show it's beauty. Trust me, it looks great. This past week I've been faithfully reading to finish two books. Yesterday while I was reading the last 100 pages of Magpie Murders, I was so engrossed in the book that I made many many errors. Of course I didn't check my work. Of course I needed to drop down stitches to fix the mistakes. Lesson learned - I cannot knit six by six blocks without looking. Ooh, that blanket has interesting texture. I like your colorwork sweater so far and love, love the fun greens of your husband's socks. I haven't been creating today as I made the big Costco run and have a bug. I am working on an email of concern and need to gather up the facts first before I finish it and even send it. I may try to learn a FL heel today after I get the teenager and her carpooling friends. I have been thinking about knitting a blanket lately but then I wonder if I could stay with it long enough to make a nice size. 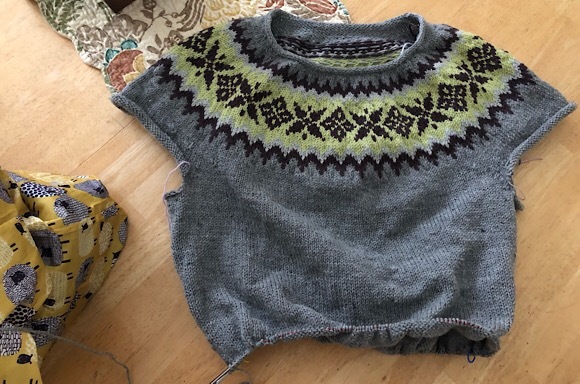 ok, except for the ripping back part - I think your knitting news is GOOD news - and wow! your sweater is looking awesome! I totally understand knitting slowly to enjoy the project. That's how I feel about all my socks right now. They are making me very happy. The sweater is so pretty! 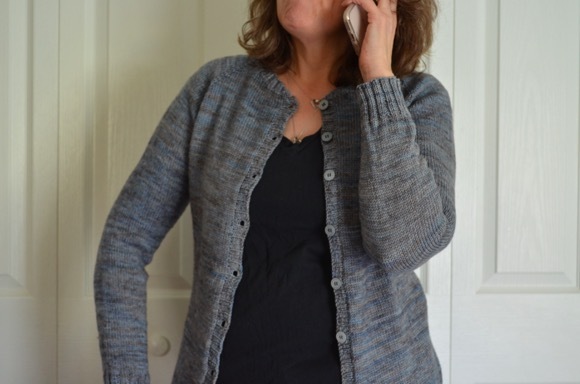 Makes me want to cast on my next yoke cardi, but I still need to make up the charts, doing Strange Brew by TinCanKnits. Hmm - shawl, socks, mitts as I enjoyed this afternoon's light but steady snowfall. 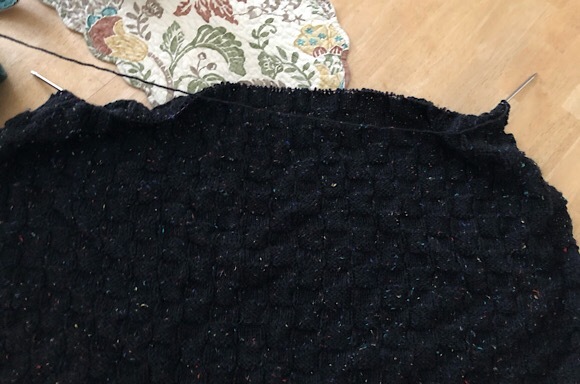 Wow, I am impressed that you're knitting with black yarn! I'm making a cowl that has a black strip and it's making me crazy. Love that sweater! Your makes are beautiful. I am always in awe of hand knitted socks. I am on the last row of a shawl and still working on Bertie's blanket. I am enjoying the process (browsing patterns) for my next grab and go project. I like to have something small to take with me for hospital/doctors appointments. That blanket looks amazing, but I understand your frustration in photographing it. I love the sweater too. When I read I become so lost to the world that I would never be able to knit at the same time. Knitting takes all my concentration. I love to listen to music when I knit or crochet. Oh all of your projects are so pretty and seem like such good things to be making during January! I've done more ripping than knitting this week! Your Fair Isle is GORGEOUS! And the socks - each time I see them I smile - they are so Happy!! I'm amazed that you can read and knit (I have to look at my knitting ALL THE TIME). Apparently my comments are posting when I comment from my phone... just wanted to say that I LOVE the knits! They are beautiful! Thank you for sharing! I love your sweater! The colors are wonderful! I have never knitted socks and am thinking that is something I might tackle after I finish my Bayland Cowl. 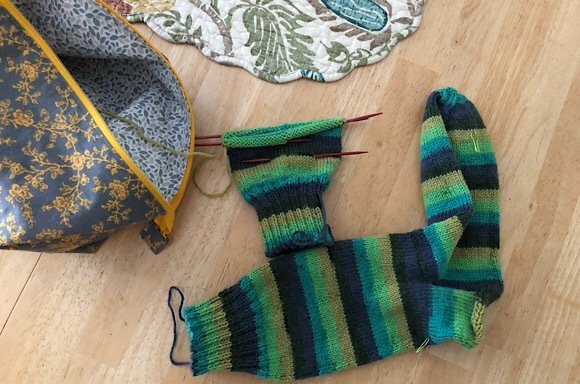 Do you know of an easy sock pattern? I just finished reading The Snow Child and loved it! Your sweater is so beautiful! 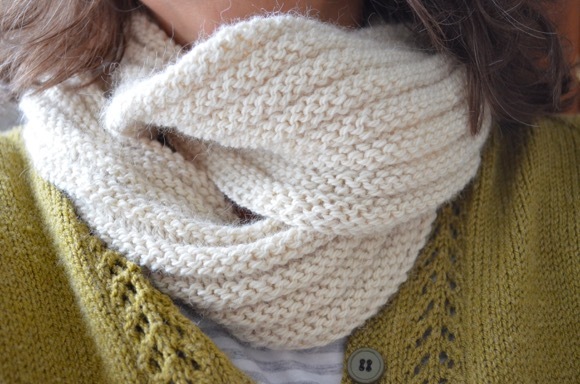 I would love to knit a yoke like that and need to get organized to do so. I'm a fan of green and really like those socks but the sweater... The sweater is Fantastic! I just LOVE that color combination you came up with. Simply gorgeous!